DIED 9TH JUNE 1889, AGED 91 YEARS. WHO DIED 23RD DECR 1890, AGED 36 YEARS. DIED 9TH NOVR 1891, AGED 21 MONTHS. DIED 13TH MAY 1900, AGED 52 YEARS. The earliest recorded smith (blacksmith) we can find in our parish dates back to 1664 in the Will and Testimony of “John Black, smith in Polquheys, new parish of Cumnock”. This was fourteen years after the parish of Cumnock had been divided into the two new parishes of Old Cumnock and New Cumnock in 1650, when the term ‘new parish of Cumnock’ was common on legal documents. John died on 1st April 1664, and may well lie in an unmarked grave in the kirkyard aside the kirk that had been built five years beforehand. It’s not known if James Black is a descendant of John Black of Polquheys but not only did they share the same surname they were both smiths. He married Agnes Gilmour (possibly daughter of John Gilmour and Margaret Campbell of Mains) and together they had 11 children – several whom died in infancy. Five children were born at Mains / Meiklemains (Castlemains) , one at Gatleochside, one at Scaurhead (? ), one at Littlemerk and three at Dalleagles, including Hugh and twins James and Agnes. James Smith was a journeyman blacksmith moving around the parish for work. Blacksmiths were in great demand serving in particular the large farming population. Goods were transported by pack-horse or by a cart where maintenance was always necessary. Horse shoes and farm implements such as sickles for bringing in the sheaves were made by the smiths. This is presumed to be Hugh the son of the above James Black, born in 1747 at Mains. 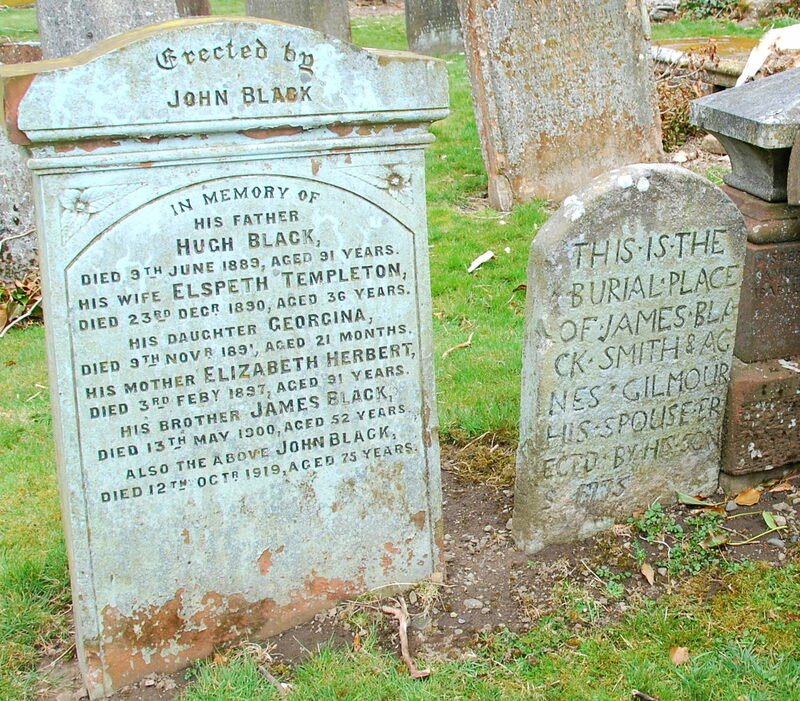 (Hugh was also a blacksmith and his son, also called Hugh, is buried alongside James Black). He married Catherine Smith and together they had six children including son Hugh born at Lowes and John born at Dalleagles, suggesting their father had returned to work as a smith there. Hugh Black married Elizabeth Herbert and together they had six children including son John, all born at Connelburn, where stood Smithfield Cottage. A master blacksmith he was listed as one of the four in New Cumnock in the 1837 Ayrshire Directory – the others being Hugh Baird (Afton Bridgend), Andrew Brown and Archibald Campbell (Dalleagles); while Robert Boyle was at Benston Smith. Hugh was the last of the line of Black – smiths! John married Elspeth Templeton and together they had six daughters and lived at Mossmark Cottages. John initially worked as a miner in the developing New Cumnock coalfield and later became an insurance agent. James Black (1708-1774) and Agnes Gilmour (1713-1775) are my 6th Great-Grandfather and Great-Grandmother and their son John (1742-1836) and his wife Janet McCledeston (1742-1843) my 5th Great-Grandfather and Great-Grandmother. Thank you for this wonderful acknowledgement!